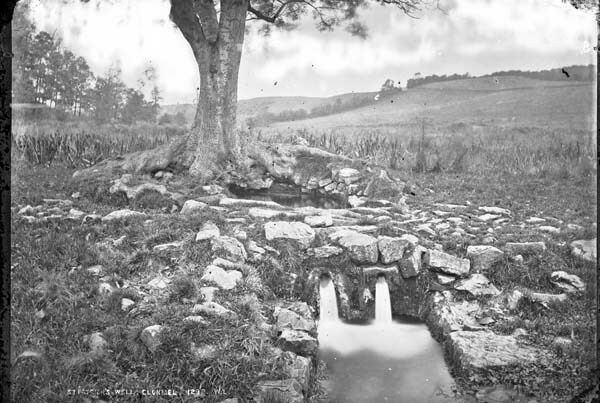 St Patrick’s well is located close to the village of Marlfield, a few miles outside of the town of Clonmel. It is well is signposted and can be accessed from the Cahir to Clonmel road and from the Marlfield village. 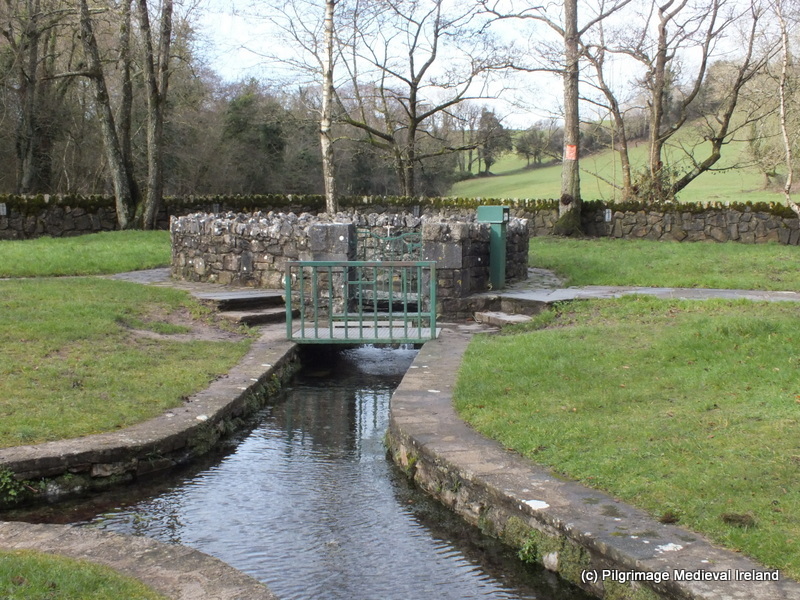 St Patrick’s well is located beside a stream at the base of a limestone cliff. This is a really lovely peaceful spot. 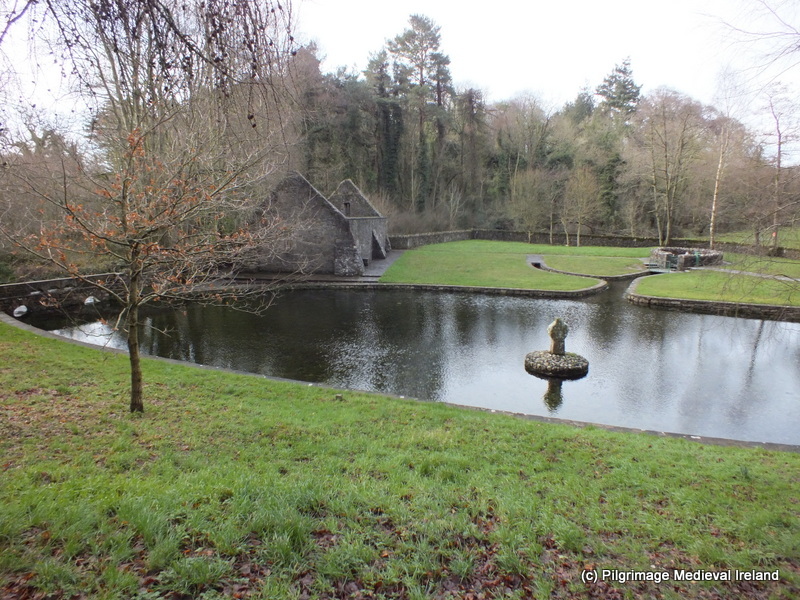 As well as being a place of pilgrimage (excuse the pun) it is also a focal point on hot sunny days for families and children who come here to hang out and paddle in the icy waters of the man-made pond beside the well. I had hoped to write a post about the well for St Patrick’s day but unfortunately the time just got away from me, so better late then never. To access the well you climb down modern steps built into the side the cliff face. The steps provide a great vantage point for views of the site. 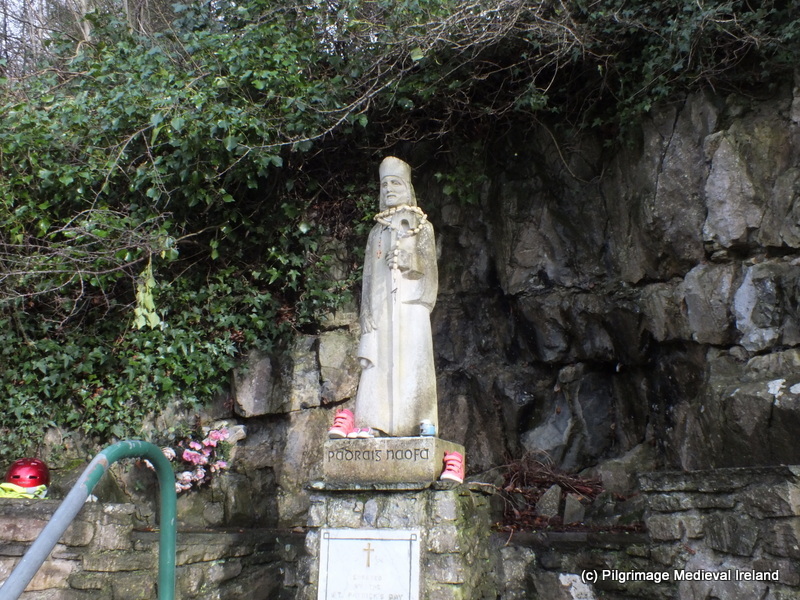 At the bottom of the steps there is a large statue of St Patrick who gazes serenely across at the holy well. People often leave votive offerings at the statue and on the day I visited there was a large rosary beads draped around the statue’s neck and children’s shoes and a candle at the base. The rest of the site consists of a bubbling spring well defined by a tear shaped stone walls whose waters flow through a small stone channel which in turn flows into a large man-made pond. The water flows through two long hallowed-out granite water spouts. Conn Manning (2007, 13) has identified the stones as flumes from an early medieval horizontal mill. The water that fills the well comes from an underground stream and the force of the water is very strong and would have been sufficient to power a mill without a need of a millpond (Manning 2007, 13). Perhaps the well had a more practical function before becoming a place of devotion. 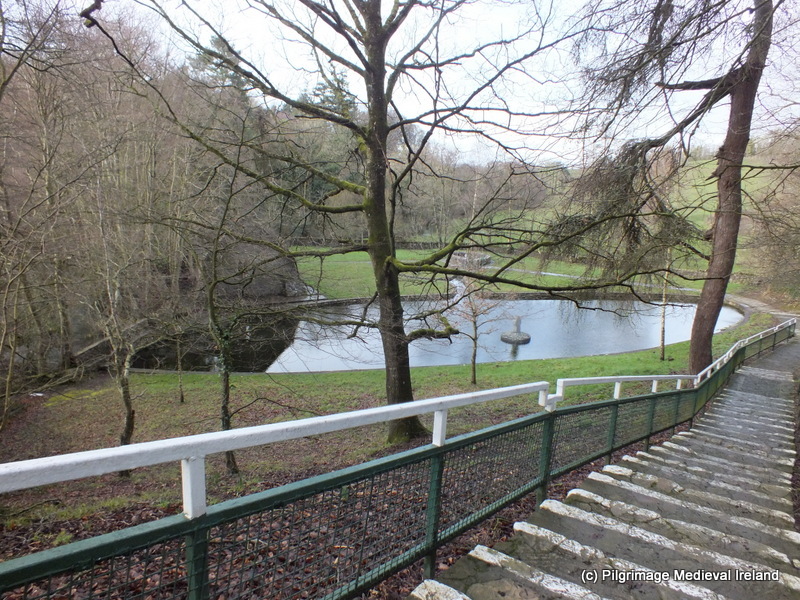 The water from the well flows through the flumes and through a modern stone lined channel which flows into a large pond. At the centre of the pond is a small undecorated early medieval stone cross . Beside the large pond are the ruins of a small church of late medieval date. This may have been used as a parish church in medieval times and appears to have been used as a place of worship until the 18th century. The building is rectangular in plan and built of limestone rubble. The exterior has been re-pointed and the building has undergone restoration in modern times. The church and the well belonged to the nearby Cistercian abbey of Inishlounaght. 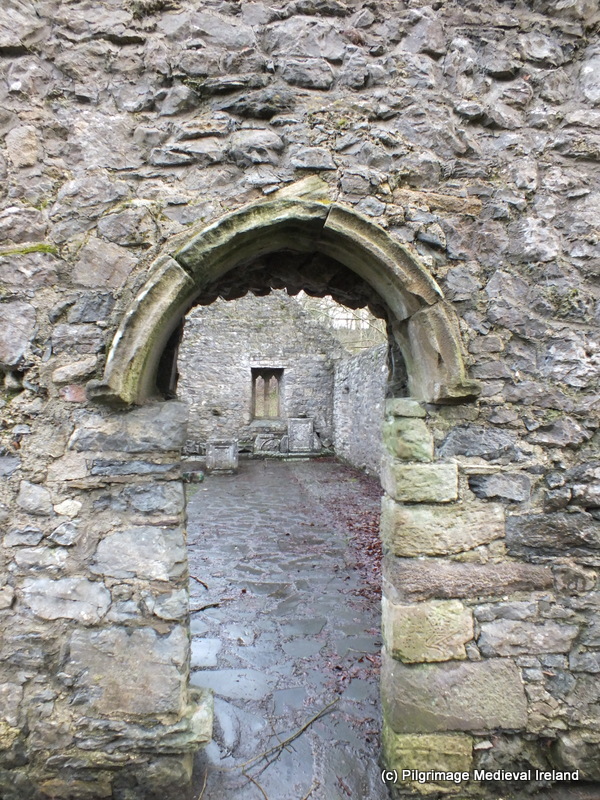 The abbey was founded in the 12th century by Donal O’Brien the King of Munster and dedicated to the Blessed Virgin. The abbey no longer survives but its site is located at the first fruits Church of Ireland on the banks of the Suir in Marlfield village. The church is entered through a doorway with hooded moulding in the west gable, which has been rebuilt in modern times. 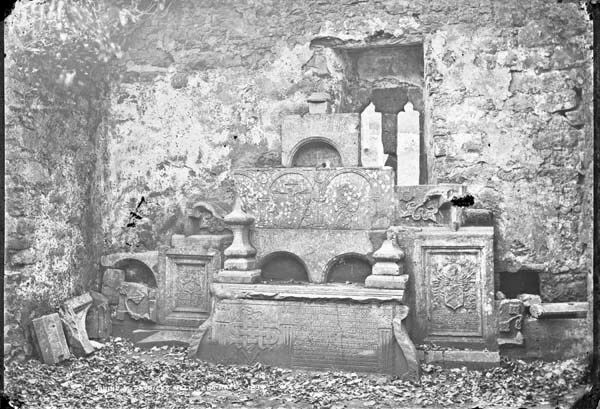 Within the church there is a late medieval alter tomb which came originally from the White Mortuary Chapel in St Mary’s church in Clonmel. The tomb was brought here following the demolition of the chapel in 1805. 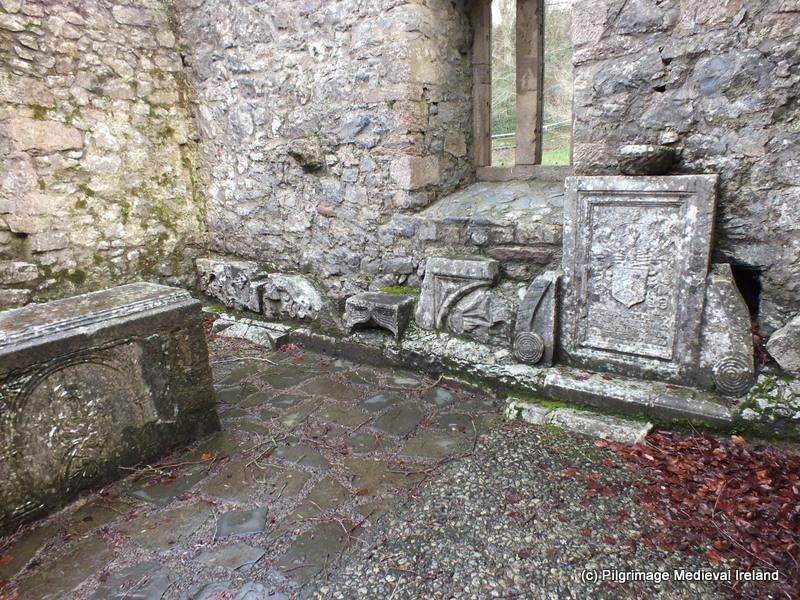 Incorporated into the east gable are a number of architectural fragments such as window heads which came from the abbey of Inishlounaght and also an armorial plaque . The landscape we see today at St Patrick well is a relatively new creation and has changed drastically in the last 50 years or so. great basin filled to the brim with bubbling crystal water.., close by it in the march is a stunted, rude and early celtic cross which marks a penitential station. 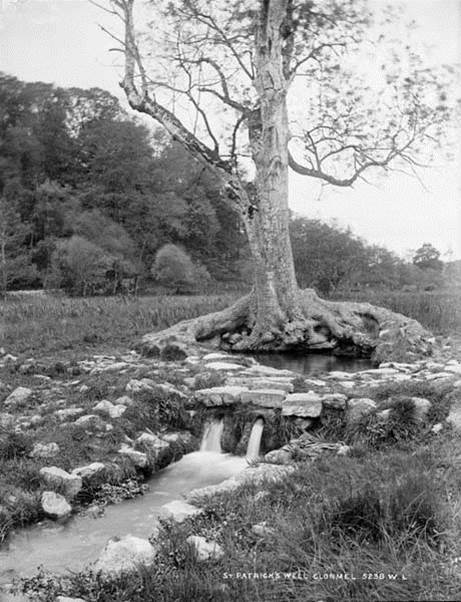 Early 20th century images of the well suggest it was originally surrounded by a low circular enclosing wall with a large ash tree growing out of the side of the well. The site had a rather beautiful wild and natural appearance but would have been marshy underfoot. 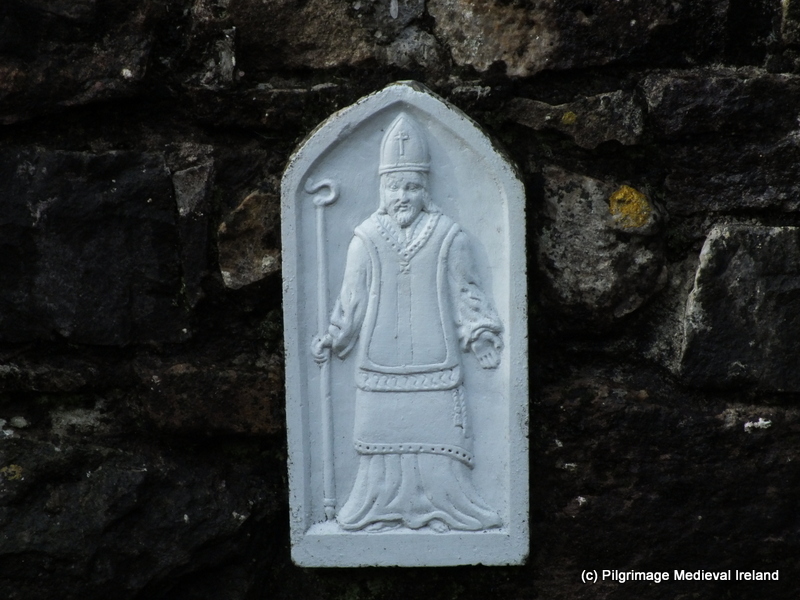 The remodelling of the site began in the 1956 with the addition of the statue of St Patrick described above. The majority of the works took place in the late 1960’s, undertaken by the St Patrick’s day society with financial aid from the Mayor of Los Angles Sam Vorty. Vorty’s mother was Johanna Egan formerly of Love Lane in Clonmel who emigrated to America and who often talked to her son about this well. 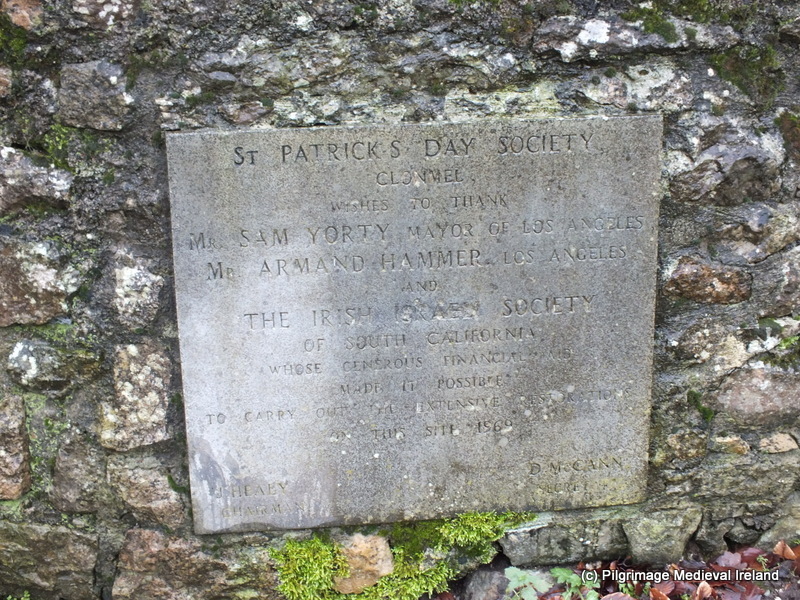 Following her death he contacted the Society of St Patrick’s day in Clonmel and offered financial help in improving the well. With the funding provided by the Mr Vorty, Mr Armand Hammer and the Irish Israeli society from South California, the St Patrick’s day society instigated a ‘clean up’ and remodelling and landscaping of the site which resulted in its current appearance. 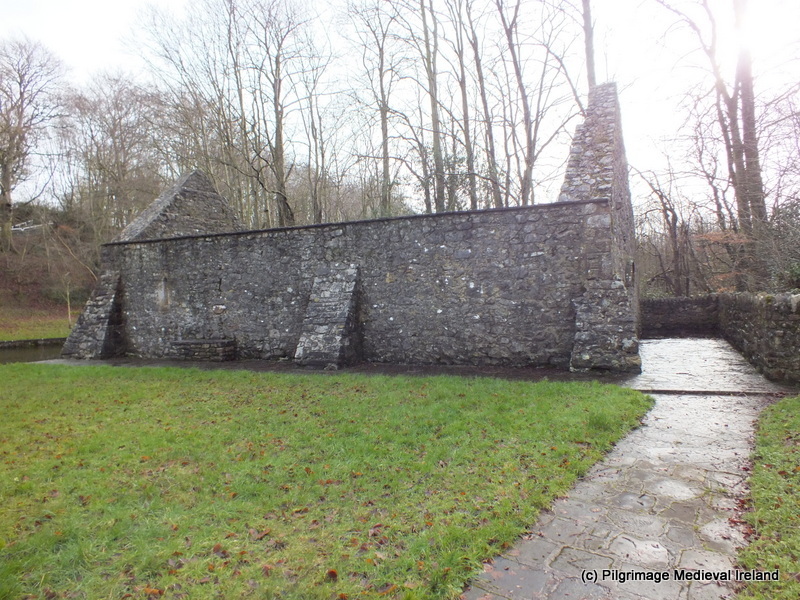 I am a bit short of time this week so I have decided to discuss the well’s association with St Patrick in another post. 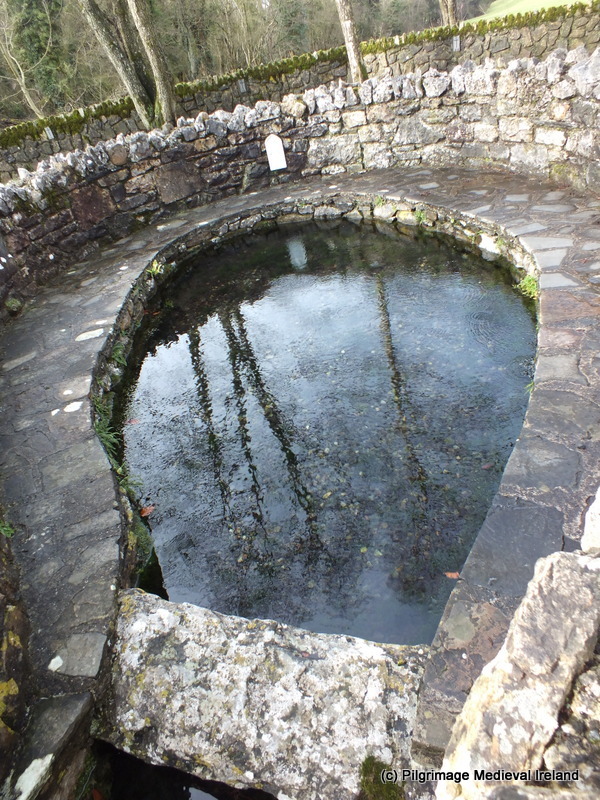 St Patrick’s well is not mentioned in any early medieval documents prior to the 12th century. The earliest direct reference to pilgrimage was recorded in 1619 when Pope Paul V granted the a plenary indulgence to all pilgrims visiting St Patrick’s church, provided they went to confession and communion and visited the church on the feast of Pentecost or on the feast day of St Patrick, any time from Vespers to sunset on the feast. it is still esteemed holy and visited by pilgrims far and near for the cure of disease especially headaches. there is an excellent mineral spring and a well which is celebrated for curing sore lips, sore eyes, the srofula* and several chronic diseases either by drinking or washing in the stream that issues from it. Thousands flock here in summertime from all places astound to pilgrimage in the stream. Others who visited the well recorded that clusters of stones within the stream along with the early medieval cross marked the pilgrim stations. It was also custom like at so many 19th and 20th century pilgrim sites for people to perform their pilgrimage in their bare feet. O’Donovan’s visit appears to have coincided with the pilgrimage of a man who had developed a head ache having joined the temperance movement. He noted the man’s ritual washing in the waters to obtain a cure. The day I visited it there was at it for the cure of a headache, which he got since he joined Father Mathew. He washed his hands, head and feet in the stream at the point where it issues form the well. Pilgrims in former days resorted to this spot. These accounts suggest the well was still visited but by local people in the mid 19th century but the hinterland of the shrine was in decline. The fortunes of the well change in the early 20th century with a revival in devotion at the well. *Scrofula was a swelling of the lymph nodes in the neck caused TB. Anon. 1853. The Dublin University Magazine Vol. 42, page 332. Hall, S.C. 1842, Ireland its Scenery and Character etc. London: How and Parsons. 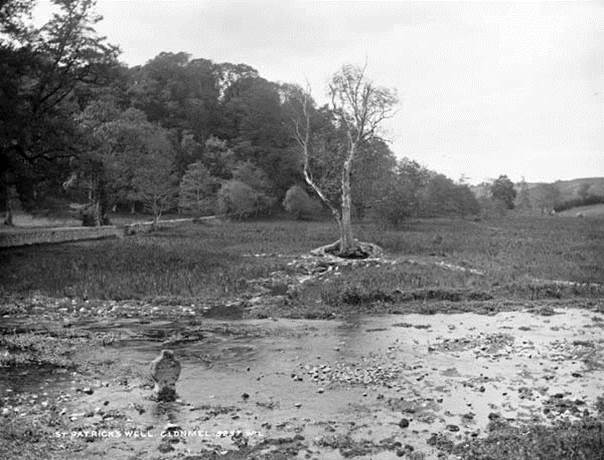 Manning, C. ‘Could well be a mill’ [St. Patrick’s Well, nr. 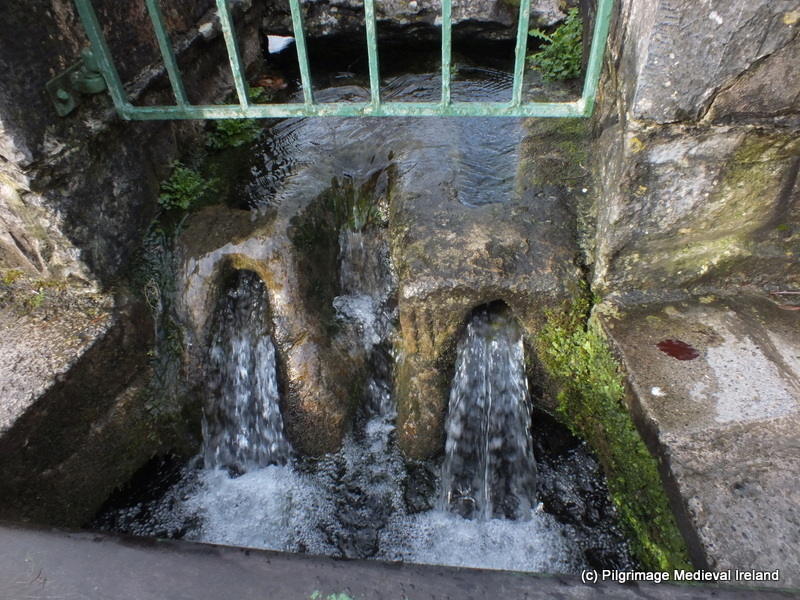 Clonmel, Co. Tipperary & St Brigit’s well nr. Tully, Co. Kildare. Stone flumes], Vol. 21. No. 1, 12-15. O’ Flanagan, Rev. M. (Complier) 1930. Letters containing information relative to the antiquities of the county of Tipperary collected during the progress of the Ordnance Survey in 1840. 3 Vols. Bray: Typescript.